"A therapeutic herbal tea containing herbs that cleanse and dissolve stones in the urinary tract as well as in the gallbladder. We use loose herbs instead of teabags because loose herbs are a coarser cut that does not oxidize as quickly. This means they have much more potency than the lower grade of herbs used in teabags. All you need is a saucepan, strainer, and a mug!" Organically grown/wildcrafted: Juniper berries, Horsetail, Cornsilk, Parsley root and other urinary tract herbs. Mild diuretic effect. People who are taking strong prescription diuretics (such as Lasix® or furosemide) should use only under the guidance of a health professional. 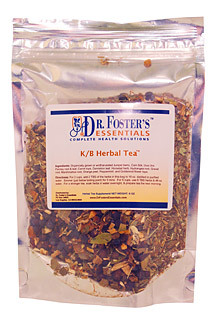 The K/B Herbal Tea is a great tonic and a must have on hand just in case the discomfort of a UTI or bladder infection occurs. This formula tastes a little earthy but it is not at all unpleasant to drink as a tea and feels really nourishing. The beneficial effects can occur with just one glass full of tea. It is also best to make extra in the evening and let the herbs soak overnight. I also purchase the Kidney Bladder Formula as well to give this tea an extra boost. I can't recommend this product enough. It works!